The July 2015 State of Oregon Economic Indexes of was released today. Full report is available here. We thank KeyBank for their generous support of this project. The three-month moving average, which smooths month-to-month volatility in the measure, stood at 0.49, where “zero” for this measure indicates average growth over the 1990-present period. Average weekly hours worked boosted the manufacturing contribution into positive territory. Within the construction sector, residential building permits made a slightly negative contribution to the measure while a solid month for employment bolstered the sector. Consistent with recent trends, low levels of initial unemployment claims, a low unemployment rate, and above-average consumer sentiment all supported the household sector. Strong job gains in the underlying service sector employment components supported a very strong overall contribution to the measure. Note that employment data is subject to possible revisions. 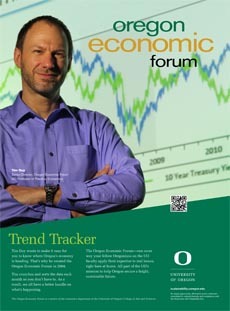 The University of Oregon Index of Economic Indicators rose 0.2% in July. Most components improved during the month Initial unemployment claims fell back to their lowest level since March, maintaining a range consistent with solid job growth. Employment services payrolls – mostly temporary help workers – rose, continuing a slow upward trend. The Oregon weight distance tax (a measure of trucking activity) manufacturing orders (a national indicator), and average weekly hours worked in the manufacturing all gained during the month, indicating that the goods producing sector of the economy remains solid. The two indicators suggest ongoing growth in Oregon at an average pace of activity. The ongoing US economic expansion provides sufficient support to expect that Oregon’s economy will continue to grow for the foreseeable future.